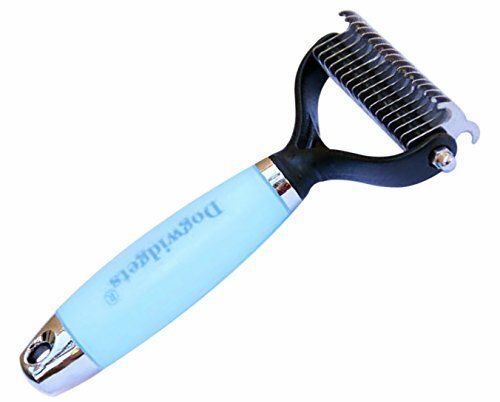 Dogwidgets Pet Dematting brush comb tool for short, long, thick, wiry and curly hair dogs and cats. The Dogwidgets pet dematting comb brush is designed by groomers to quickly remove dead loose knotted hair, mats and tangles from your pets with ease. The dematting comb is made of stainless steel blades with rounded edge make it safe on sensitive skins and silica gel anti-slip type to get maximum handling and control. After first use, you will notice your dog's hair is much sleeker, shiner, healthier and your pet will look great too! Daily massage using the dematting tool can help promote Blood circulation and bring out pet's natural oils and healthier skin coat. 1. Stainless steel teeth with rounded tips. 2. Comfortable silica gel handle. This tool is very pet friendly! Also very gentle on your pet! Suitable for all dogs and or cats of all shapes and sizes from small, medium to large dogs. It can be used on long, thin or thick hair. Practicing good pet hygiene is beneficial to your pet's health! In return, your pet will feel more loved than ever and in doing so they will love you back more!! Try the Dogwidgets Pet De-Shedding Tool now! Buy now with confidence. Your satisfaction is our guarantee!!! IDEAL FOR ALL DOGS AND CATS. Works with small, medium and large dogs and cats with stubborn mats and tangles. CLEARS ALL MATS ANG TANGLES. Double sided comb with different teeth on each side pins made of stainless steel. Quickly removes loose hair, mats and tangles with minimal strokes. ERGONOMIC GEL HANDLE. Silica gel anti-slip handle type conforms to your hand for maximum control. GREAT FOR GROOMING AND DAILY MASSAGE. Daily combing improves your pet's health and mental state. BEST CUSTOMER SUPPORT. Fat customer email and phone support. BUY WITH CONFIDENCE.